The Centers for Disease Control and Prevention has identified individuals in correctional facilities at high-risk for suicide. Risk factors unique to a correctional environment such as shock of incarceration, guilt/shame over incarceration, and existing mental health issues (e.g., alcohol/substance use or mental health disorders) are risk factors for suicide. Isolation from family and friends compounds this risk. This course will provide youth workers working in juvenile detention and other facilities that house youthful offenders with an overview of suicide in juvenile correctional facilities. You will review information related to statistics of suicide in juvenile correctional facilities, examine common myths and facts about suicide, review liability issues related to suicide in juvenile correctional facilities, and be introduced to the components of what should be included in a facility’s suicide prevention program. 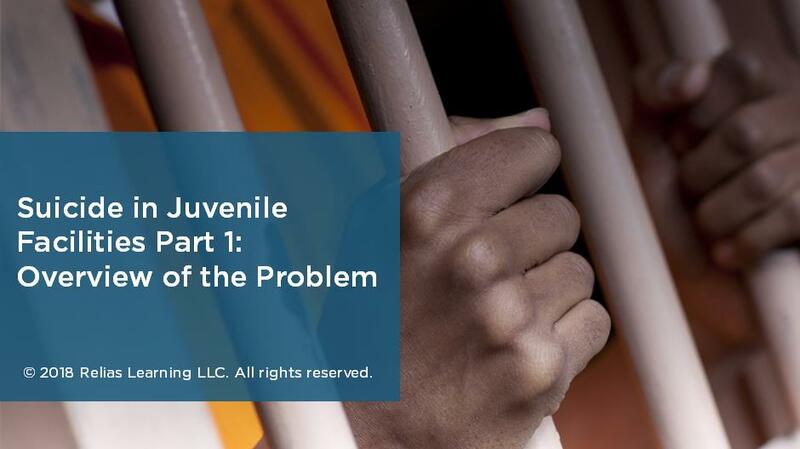 Recognize 6 risk factors that increase the likelihood of suicide related to juvenile justice facilities. Discuss 8 myths and facts related to suicide. Identify 4 areas that liability cases focus on related to resident suicide, and define the standard of proof used to determine liability in suicide civil rights and wrongful death cases. Describe the purpose and 12 components of a suicide prevention program.